Since I started wearing makeup I’ve used about 5 brands in the powder department, started with Marykay then Ailin, Iman, Flori Roberts, M.A.C and now Milani. I love my M.A.C products. I feel they are worth the hype and price point, however they may not be suitable for all weather conditions. I normally use the M.A.C mineralise skin finish. I love the glow it gives my face and how long it lasts, but since I got to Nigeria it hasn’t been my best friend. Due to the heat, my face gets soiled quickly then the glow/bronze finish in the MSF powder makes me appear oily. I didn’t like the appearance. My cousin Lanre introduced me to Milani powder late last year but I didn’t buy into the hype, so I chose not to get it. Two weeks ago, I went to my aunt’s studio and she was using Milani powder on a model, I loved the finish so I decided to get one for myself. I bought the Milani mineral compact powder (shade 110 deep) from my local Beauty supply store (BBHbeauty supply, Shop E233, Ikota Shopping complex V.G.C Ajah). I got it for about N2,400. I tried it on and loved it even more. It’s natural, light weight and doesn’t overly cake my face. Although it’s more yellow toned than red, it works just fine on my skin. I use a Revlon photoready foundation and the Milani powder works well with it for everyday use. On days where I have an event or want to look extra made-up I may reach for my M.A.C. But so far I love this powder. It covers well and the wearability is just perfect. 4-5hours then you may need to touch up depending on your skin type. I rate this product 8/10 simply because they don’t have a wide spectrum in shades. Just 3 shades: Medium, warm and deep. Hence, people with deeper skin tones may struggle with choosing a shade from this particular line. Their pressed powder has a wider color range. All three types of powder in the Milani powder range. It’s not initial excitement. I’m a powder whore but Milani powder is go to powder all day everyday. I use it with any foundation I feel like. I only reach out for my mac powder when I feel like it. Milani powder is light weight and the finish is perfectos. I believe it was made specially for the Nigerian weather. I remember when i first bought Milani powder, i was a bit sceptical about it. The lady i bought it from said that if i try it and its not good, she’ll refund my money. Honestly, its been over a year and I’ve had no regrets so far. It doesn’t cake and is perfect for our Nigerian weather. I always recommend it to people. And I love that its very affordable. Hi, thanks for this post. I have very oily skin and I don’t use primers. Currently, I am using IMAN luminous second to none and I love it, however, by the middle of the day, I look like fried puff puff soaked in oil. Someone asked me to check out Milani powder. I don’t know which to use or what my color is, even. Haha I’ve used Ailin too, talk about cheapie powder but the difference in their shades is too much, I used number 3 or there about and it’s like mud compared to my skin tone, now I use it as an eyeshadow and it works perfectly. For the Milani, I use the mineral compact powder in 110 deep as well (but the package I have is that of the multitasker face, maybe they changed it) and it was perfect when I bought it, got mine for about N2500 or so. plz is it better than sleek suede effect? Hello, I’ve never used sleek suede effect so I can’t really say. Thank you for stopping by. Just bought mine today. I’m glad to stumble on this cos I’m rest assured more that I didn’t make the wrong decision. I hv been using Mary Kay foundation n powder for like 10yrs now,but started notice red rashes on my face. Was advice to discontinue it and try Tara foundation n milani mineral compact. I hope my face gets better. I bought a milani powder but it was in more of a circle container rather than square. When I applied it was peppery. I didn’t try it since then. I’m scared it is a fake. I bought it from a wholesaler in Lagos markeT. Please how do I know a fake milani powder? I bought milani powder and it came in a roundish container. Immediately i applied it started peppering me mildly as if there was mint. Have I bought a fake? Pls whats the difference between the Milani maltitasker, pressed powder and mineral powder? Which is best for oily/acne prone stkin? Pls reply is needed urgently. Thanks. Pls what is the difference between the Milani multitasker, pressed powder and mineral powder, and which of them can be recommended for oily/acne prone skin? Pls your advice is needed urgently, I’m about going to the store. thanks. Nice Blog! 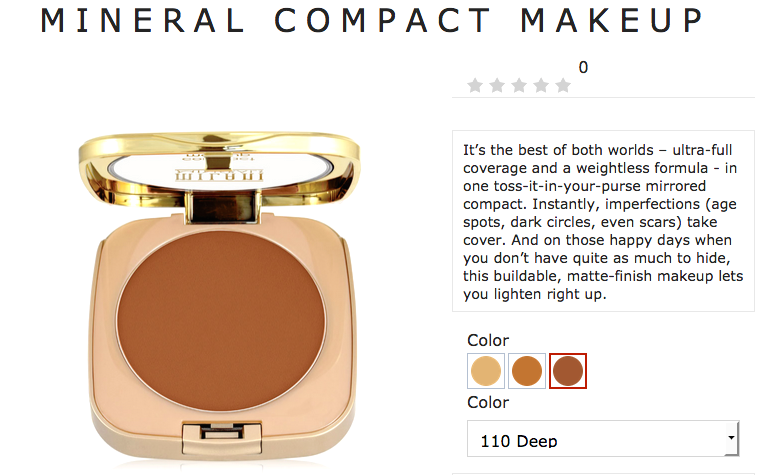 I’ve been wanting to try the MIlani powder fow a while now and this has just convinced me. But I’m a bit confused about the shades, whether to buy deep or warm. I use Marykay timewise foundation in Bronze 6, do u think Milani Powder in deep would suit me. Im worried it might be too dark. (maybe cos I know its the darkest shade) Pls Reply!!! I’m an addict when it comes to make and I have tried all sorts of products. I can say categorically, that Milani is one of the best powders available in the Nigerian market. Once u apply in d morning. It stays on ur face almost all day except if your face is extremely oily. However, I’m beginning to feel that its fake exists. I bought milani powder 2200 recently jux to be told dat the pin has expired due to overuse. How will I diferentiate d original from fake? It depends on how dark you are. you could buy 110, to be on the safe side . Hey Tosin, am fair and want to try Milani product,pls what colour should I buy that will match my fair skin….? must all original Milani comes with scratch because the one I bought is in tube three effects combine in one foundation make up base + concealer + cream powder and there is no scratch in the body how will I Identify if it is original. I’m caramel in Revlon colorstay foundation for oily/combo skin , warm almond in bobbi brown stick foundation and i used to use MAC MSF in dark (although if i remember correctly i think it might have been slightly more red than i’d like), i’m inbetween NC45 and NC50 in MAC (maybe an NC47/48?, should i choose warm or deep? Just purchased milani warm 109 & sent the code. The response was “stop pin expired due to over use” did I purchase the fake? I just got mine in medium 108 but didn’t see a scratch card behind it I guess its an old park but how do I know its original tosin. Thanks. Tried it today tho and it serves its purpose. But still want to b sure of it’s originality. is milani mineral compact powder (shade 110 deep good for chocolate person? is milani mineral compact powder shade 110 deep also good 4 chocolate person?